Browse through our latest projects to get a little taste of some of the jobs our expert garage door technicians have been working on recently. 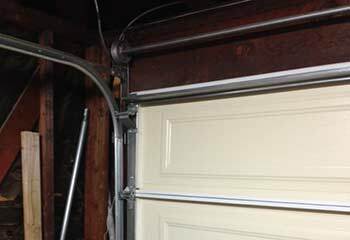 Customer Issue: A minor car accident pushed the bottom-most left garage door rollers out of their track. Our Solution: After some hands-on repair work to the bent edges of the track, our technicians raised the door off the wall. They then did a little more smoothing down and straightening of the track before sliding the door back down into place and reconnecting it for testing. Customer Issue: Safety sensors not working. 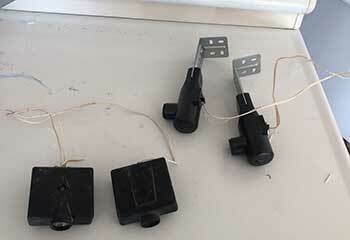 Our Solution: We checked the sensor lenses, and discovered one was scratched and the other broken. We replaced both units and then installed new ones in their place and made sure they were properly aligned. Before leaving, we made sure the door reversed properly when something was blocking its path. 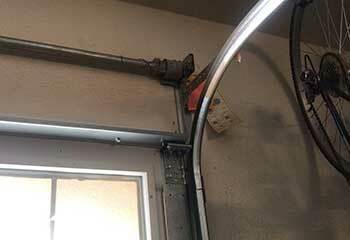 Our Solution: The door was relatively small and had only one torsion unit installed. We began by first disconnecting the opener and then removed the damaged spring, and fitted a new one in its place. We then made sure the new unit's tension was adjusted properly and that it had no problem supporting the weight of the door. 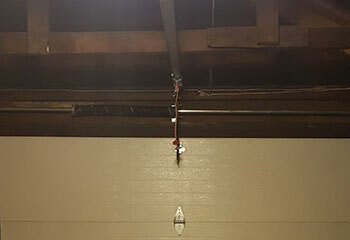 Customer Issue: Garage door roller stuck inside track. Our Solution: Upon inspecting the system, we found that a roller got stuck inside the track and was preventing the movement of the door. We carefully removed the faulty part and replaced it with a new roller. We then examined the rest of the units and replaced a couple more that were significantly worn.